There are conventions happening all over the world every day, in every field. Many people are required to travel and attend conventions for work. Others attend conventions that cater to their unique hobbies or interests. But have you ever attended a convention specifically tailored to an aspect of your physical appearance? 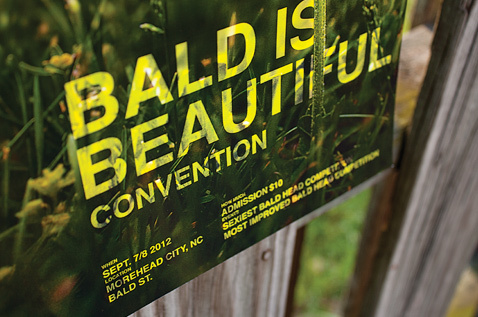 In Morehead City, North Carolina, the Bald is Beautiful convention is put on by the Bald Headed Men of America organization (boasting an impressive 35 000 members worldwide) to celebrate the beauty of baldness. This is your guide to navigating the three day event. Like the accommodations in many small American towns, Morehead City has the usual collection of chain hotels and motels to choose from. Perhaps the only lodging of note is the Buccaneer Inn because it has the boldest name, and sounds like an awesome place for a bunch of bald guys to spend three days. Once you’ve booked your room, grab your fellow baldies and meet at El’s Drive-In for hotdogs and shrimp burgers served by car-hopping waitresses. Be sure to bring cash, this drive-in spot is cash-only. For the competitors there are plenty of prizes to be one. Enter to be considered for awards like “Sexiest Bald Head”, “Most Improved Bald Head”, and “Most Distinguished Bald Head”. Be prepared: the all-female judging panel will conduct a full examination including feeling (caressing) the scalp, examining shine and long distance viewing to ascertain the twinkle in the candidate’s smile. Or, head to town and visit Golden’s Barber Shop for a fresh shave before you enter the Telly Savalas and Montel Williams’ look-a-like competitions!